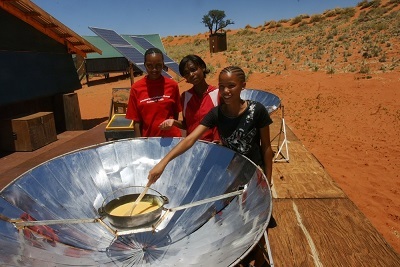 The Namib Desert Environmental Education Trust (NaDEET) is a non-profit, Namibian trust established in 2003. The NaDEET Centre is located 100 km south of Sesriem/Sossusvlei on the NamibRand Nature Reserve and the head office is located in the coastal city of Swakopmund. NaDEET believes environmental education must not only increase awareness and knowledge but also eco-friendly attitudes and skills in Namibia's youth and educators to promote participation. addressing relevant environmental issues through hands-on, experiential learning. supporting the Namibian school curricula in a practical, learner-centred way. providing the opportunity of experiencing the county's namesake - the Namib Desert - first hand, thus creating a sense of respect and responsibility for their natural environment. We offer three to five day hands-on, experiential, environmental education programmes for Namibians. Most of our programmes are attended by primary school children. However, we also offer courses to secondary schools, out-of-school youth, educators and community members. The main NaDEET literacy project is a youth magazine available at no cost to all learners, educators and interested citizens in Namibia, called the Bush Telegraph. Approximately 18,000 learners and educators are currently subscribed. It aims to increase knowledge of and improve attitudes towards our environment through reading. This project is complemented by our "It's Time to ..." activity book and guide book series. Community outreach is NaDEET's newest initiative that brings environmental education to urban and rural communities in Namibia. It aims to provide knowledge and equip people with skills to protect their local environment within their own communities.